It’s possible I have a thing for tarts. Who would have guessed? September brings Autumn, which means cooler weather, drier air, and the first reasonable month since winter for the chapter on meringue. As usual, the beginning of the chapter is chock full of interesting information about the theme, including the differences between different kinds of meringue and a handy chart of sugar-egg-white ratios. These are the only worthwhile parts of the Professional Pastry chef, so reading through it is, literally, the highlight of the project for me. My original intention was to bake Alaska, but then I, er, was busy when I should have been doing some of the leg work to prepare. (Taking days off once in a while seems to result in a disproportionately large loss in overall productivity. I think I need to explore this phenomena more extensively through scientific replication) So I made the decision to switch over to the tartlet recipe because, hey, tartlets. Mmmmmm. 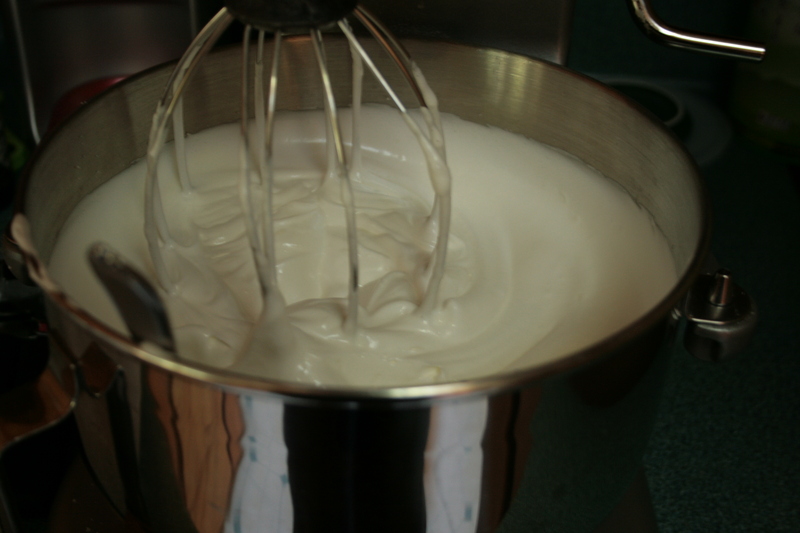 The first step here was to make a meringue that would be turned into the tart shells. Look at those glossy, stiff peaks. Sweet. No, really, they’ve been sweetened. Next was piping the meringue into the shells. I learned from the last time I tried to follow the piping instructions out of this cooking, went for a largeish tip, and was pleased with my results. My shells were pretty, and the weirdness had more to do with my lack of technical finesse than tip fail. Someday, circles won’t be so hard. But first, I think I’ll have to conquer straight lines. While those baked (and let me tell you, my entire oven was full of meringue) I whipped together lemon curd for the filling. This is yet anther handy pastry filler thing which have more or less been fairly successful from this book. 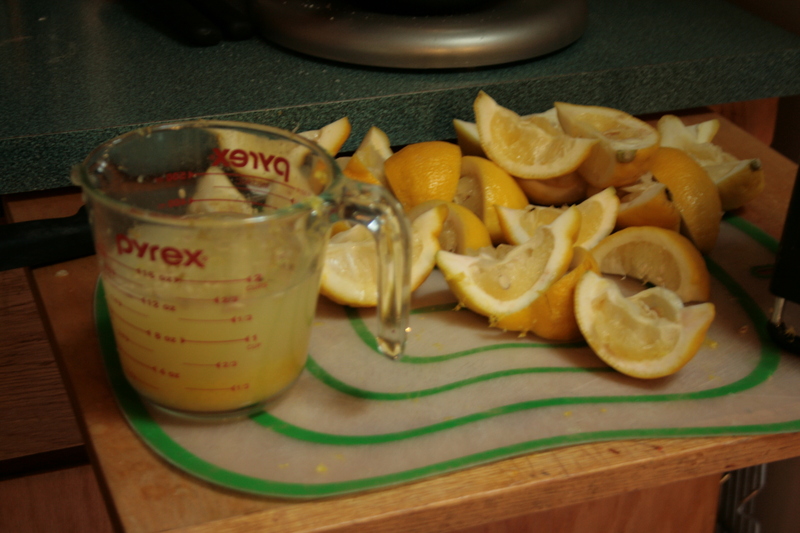 This recipe called for the juice from and zest of eight lemons. That’s a lot of squeezing and zesting. I’m lazy. I zested maybe three of the lemons and decided that would have to do. 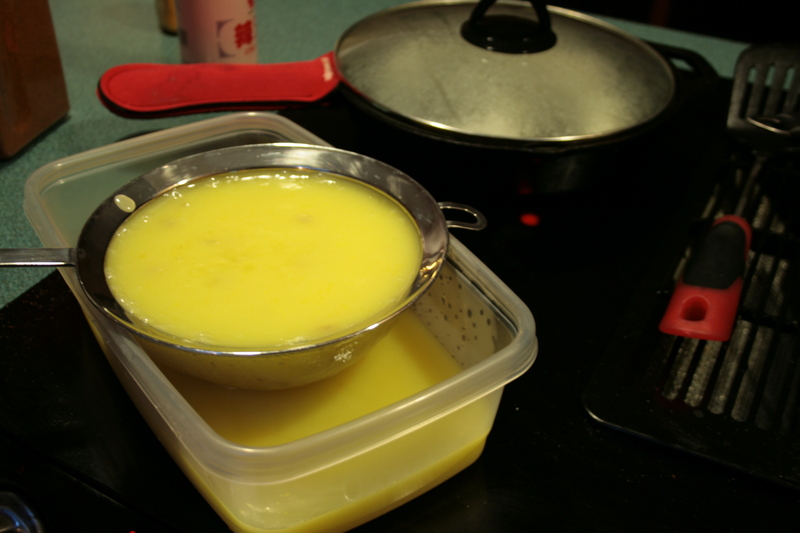 Lots of things get thrown into a pot and stirred until we get thickening and boiling and other cooking magic. There’s a point where Sylvie looks over and says, “You threw everything in at once? That’s not how it’s done.” Then she looked it up online. Apparently there are multiple schools of lemon curd, which disagreements about technique. 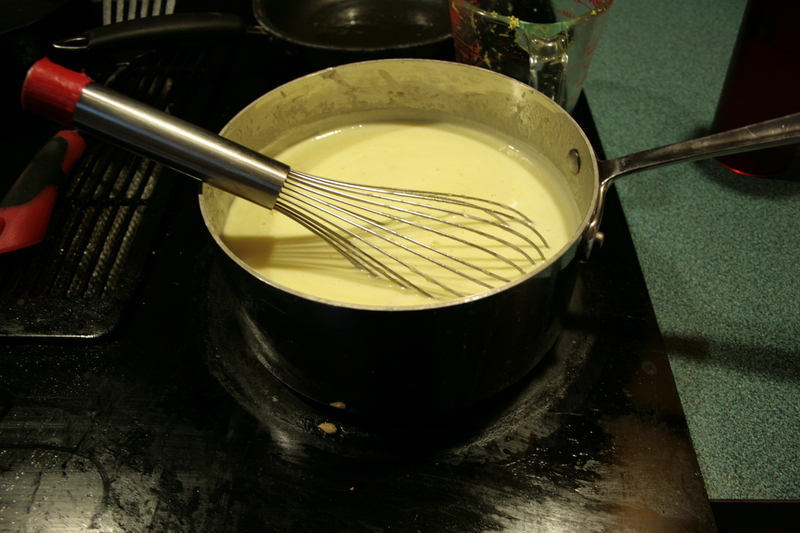 They center mostly on the correct time to add the butter, and whether one should invoke the elder gods before, or after commencing to stir against the grain of unnatural angles. The all-at-once technique is simpler and faster. The other one increases the odds of having your mind destroyed by ancient creatures from space. Speaking of mind destruction, this was another recipe requiring use of the sieve. I quailed. I cowered. I persisted. These were mega tasty, and not all that hard to do. 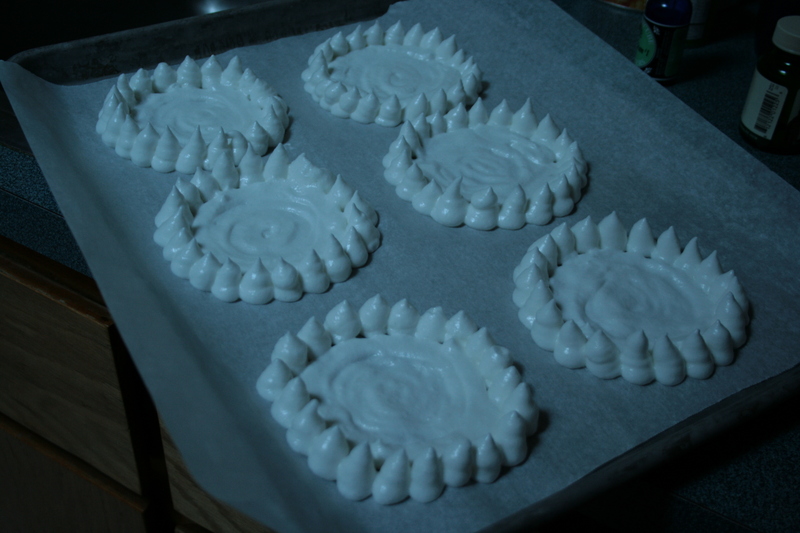 The longest step was definitely piping the shells, but they turned out pretty enough to justify the effort. What they weren’t was durable. 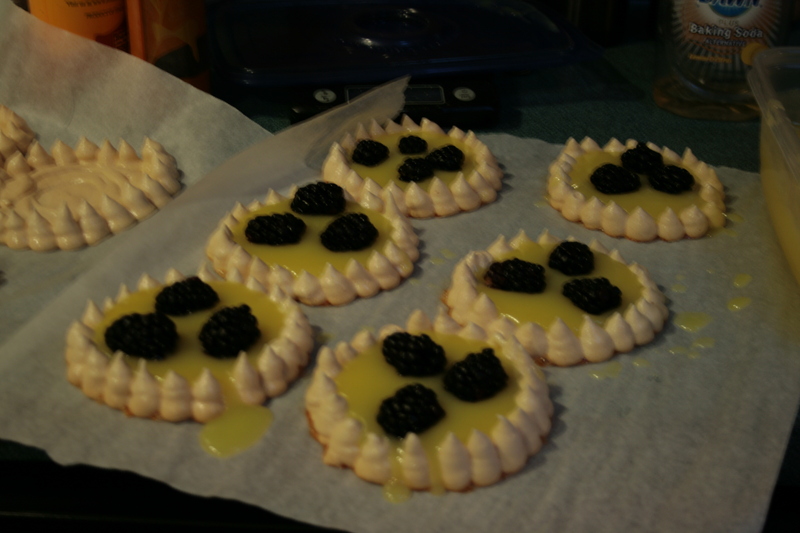 Prepping these tarts ahead of time for serving an hour later was a disastrously bad idea, because the lemon curd soaked through the meringue and made transfer impossible. Also, meringue doesn’t exactly last super well. 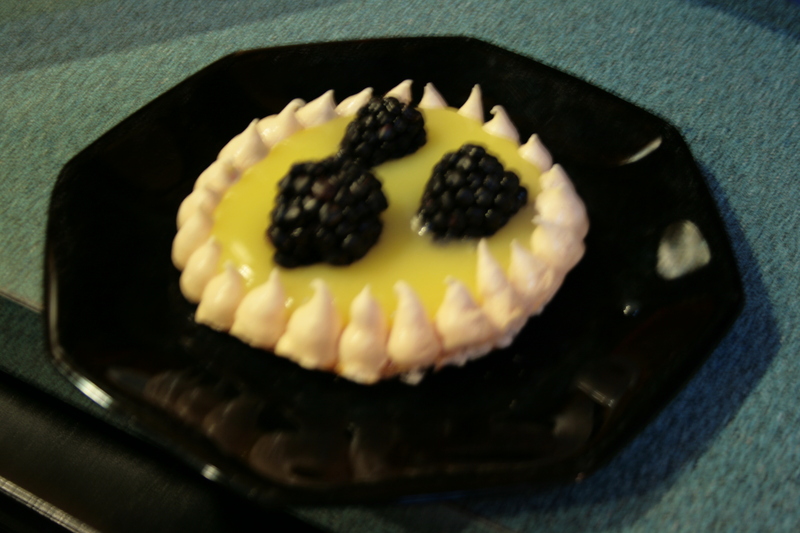 Lemon curd I will definitely make again, and it goes fabulously with blackberries. In future, I’d only do meringue shells if I was doing something where assembling them as I was serving would be fine, and I wanted to show off. I’m not sure when those two circumstances would ever show up together. I suspect short dough crusts are where it’s at.